Thanks for posting the photo. 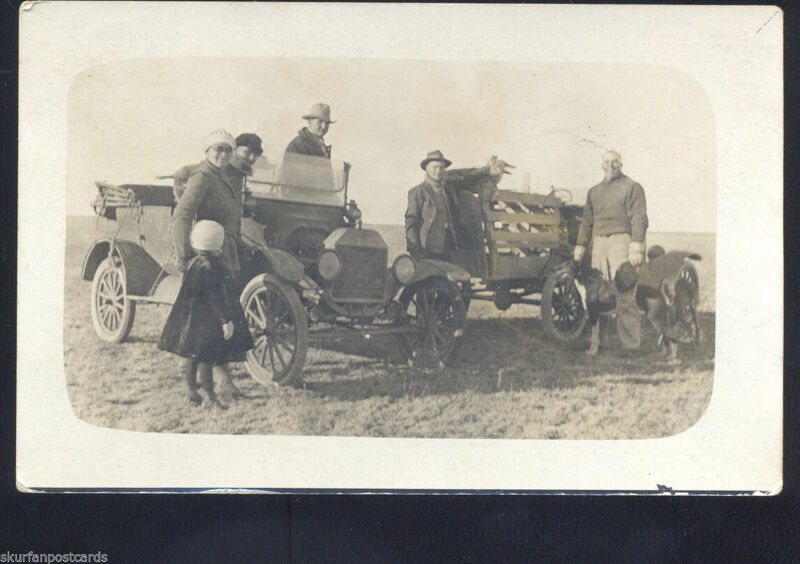 It appears to be a black radiator mid 1917 or a little later based on the fenders and the unequal length windshield hinges. But if you look you can clearly see the 1915-1916 style hood former (used only those two years) as well as the brass radiator. It is hard to know with a mixture of parts which if any of them were part of the original T and which were swapped out over time. In this case I my first guess would be the black radiator needed to be replaced and they found a good price on a brass radiator, 1915-16 hood former, and at one time hood. If you don't get the hood you don't need the hood former. Zooming in I think the rear arm rest has end caps but some of the last of the 1916 model year cars had the metal cap on the end of the arm rest -- so that doesn't really that much. I wonder what the occasion was? both had a dog in their car and only men with a girl. The car on the right also had a dog on the ground. Notice the ropes on the side of the touring? Why? What were they carrying?